Obstructive Sleep Apnea (OSA) affects about 100 million people worldwide with 85% of cases going undiagnosed. Of Atrial Fibrillation patients, about 43% additionally suffer with Obstructive Sleep Apnea. Could undiagnosed sleep apnea be linked to development of Atrial Fibrillation? OSA is characterized by repetitive episodes of shallow or paused breathing during sleep that lead to a drop in blood oxygen level and disrupted sleep. 85% of Sleep Apnea cases go undiagnosed. New research has found that patients with Sleep Apnea may be at greater risk of developing Atrial Fibrillation. Abnormal oxygen saturation level during sleep may be responsible. Lead author Dr. Tetyana Kendzerska, Ph.D., of the University of Ottawa in Canada, and colleagues reviewed the records of 8,256 adults (average age 47) with suspected OSA. Individuals with any diagnosis of arrhythmias were excluded. Participants were followed for an average of 10 years. During that time, 173 developed A-Fib resulting in hospitalization. The reviewers found that the amount of sleep time spent with lower than normal oxygen saturation (below 90 percent) was a significant predictor of developing Atrial Fibrillation. By contrast, the number of breathing pauses during each hour of sleep did not appear to affect A-Fib risk. Study participants who developed A-Fib during the follow-up period were more likely to be older, current or former smokers, and have a high level of comorbidities (e.g. high blood pressure, or hypertension). Take Action: Sleep Apnea Can be Lethal: If you have untreated Sleep Apnea, you are at greater risk of having a more severe form of A-Fib or of not benefiting from an A-Fib treatment. So many A-Fib patients also suffer from sleep apnea that many Electrophysiologists (EPs) routinely send their patients for a sleep apnea study. Sleep apnea isn’t a minor health problem, and it’s a condition you can do something about. To learn more, see Sleep Apnea: When Snoring Can Be Lethal. Recently I posted about a FREE online course ‘ECG Basics‘ at Healio/LearnTheHeart.com designed to expand your understanding of Electrocardiograms (ECG or EKG) (see our description page). You can also challenge yourself with the Beginner ECG Quiz featuring detailed answers and links to pertinent explanation pages. Or test your overall knowledge of Atrial Fibrillation with a multiple choice Atrial Fibrillation Quiz. Pr. Sebastian Knecht from CHU Brugmann, Brussels, (now AZ Sint Jan, Brugge), Belgium gave a presentation entitled “AFACART Trial—Design and Preliminary Results.” (AFACART stands for “Non-Invasive Mapping of Atrial Fibrillation,” a new name for ECGI). In preparation for their ablation the patient dons the ECGI vest-like device. The data generated creates an image of the heart and pinpoints sites (“drivers”) producing A-Fib signals. This 3-D computer model of the patient’s heart is used during the ablation procedure. The AFACART trial is a European multicenter, feasibility, non-randomized study using “Panoramic Electrographic Non-Invasive Mapping”, specifically the CardioInsight—ECVUE System, for ablation of persistent A-Fib. Ablation patients are to be followed for 12 months. The effectiveness of Panoramic Electrographic Non-Invasive Mapping is to be compared to conventional mapping and ablation procedures. Eight European centers in France, Belgium and Germany are participating in this clinical trial. None of these centers had any practical experience with this system before this study. If A-Fib doesn’t terminate to sinus rhythm or stable atrial tachycardia isn’t achieved (> 5 min), then a standard PVI is performed. This is followed by linear lesions. And finally by Electrocardioversion. • Step One (driver ablation only): 64% of the persistent A-Fib patients had their A-Fib terminated. In 94% of patients, driver ablation had a significant impact on the A-Fib termination process. A-Fib cycle length was prolonged in all persistent patients except for 6%. Even patients who were not terminated (27%) had their A-Fib cycle length prolonged by driver ablation. After 12 months, 72% of patients were A-Fib free and no longer taking antiarrhythmic meds (AADs). 31% had Atrial Tachycardia recurrence, but many had a second ablation. Overall 83% were A-Fib free, 17% had Atrial Tachycardias and only 9% were still in A-Fib. Ablation procedure time averaged only 44.7 minutes. As the number of driver regions increased, the ablation success rate decreased. 66% of drivers were in the Left Atrium, 34% in the right. 70% of termination sites were in the left atrium, 30% in the right. • In these persistent A-Fib patients, 50% of both atria had CFAEs. • Most (but not all) driver sites contained CFAEs. • Successful driver ablation only ablated 19% of both atria (this is a major improvement and resulted in much less ablation damage to the heart compared to trying to ablate all CFAE areas). Ablation of A-Fib drivers is associated with a high rate of A-Fib termination. • Drivers are distributed in both atria (2/3 LA and 1/3 RA). • Results are reproducible among centers without prior practical experience with the system. • Preliminary chronic results are very promising. Driver Ablation More Important Than PVI in Persistent A-Fib: ECGI is changing the way ablations are done and our understanding of A-Fib. In persistent A-Fib, the mapping and ablation of drivers is more important and is done before a PVI ablation. While driver ablation had a 64% success rate, doing a standard PVI after driver ablation only improved results by 2%. ECGI/ECVUE Major Improvement in Ablation Success Rate: An 83% success rate after 12 months following ablations for tachycardias, is a major improvement and source of hope for persistent A-Fib patients. These results were even better when one considers that only 9% were still in A-Fib. ECGI/ECVUE Results in Much Fewer Ablation Burns: Previous protocols for ablating persistent A-Fib usually involved mapping and ablating CFAEs. But CFAEs in persistent A-Fib patients can cover 50% of the atria surfaces which often necessitated a lot of burns and debulking. Too many ablation burns could result in the development of fibrosis (dead heart tissue where the ablation catheter produced burns and scarring) and a stiffening of the atria with loss of pumping ability. ECGI/ECVUE only requires ablating 19% of the CFAE areas resulting in much less lasting damage to heart tissue. Driver Ablation Prolongs A-Fib Cycle Length: Driver ablation had a major effect on the A-Fib termination process. A-Fib cycle length was prolonged in all but 6% of the persistent A-Fib patients. This is perhaps a first step in improving outcomes for persistent A-Fib patients. Reproducibility: The most important finding of Dr. Knecht’s report is that ECGI/ECVUE works in other centers without doctors (operators) having to undergo extensive training. To learn more about ECGI, see Non-Invasive Electrocardiographic Imaging (ECGI): Presentation Summary and Comments from the 2013 AF Symposium. You may want to read this report in conjunction with Dr. Haissaguerre’s 2015 AF Symposium presentation The Changing Ablation World: Going Beyond PVI With ECGI Mapping and Ablation Techniques. He described a study of the ablation of 50 persistent A-Fib patients using ECGI to map and ablate A-Fib signal drivers. A-Fib was terminated in 79% of patients, with 10% returned to sinus rhythm and the remaining 69% in tachycardias (but with no A-Fib). For those still in arrhythmia, ECGI was used to map, analyze and diagnose the locations of the arrhythmias signals, and additional ablation lesions were performed. Identified were 25 macro-reentry circuits and 14 focal/localized-reentry circuits. Dr. Jais showed many slides and videos of how ECGI mapped and analyzed where these arrhythmias were coming from and how they were ablated. Dr. Jais stated that the study data revealed, “the focal/localized-reentry were adjacent to drivers at 0.9cm from the core of driver with low voltage (0.5 mV)”. To clarify, this means that the drivers of the remaining arrhythmias were located very close (adjacent) to the drivers previously mapped by ECGI. Therefore, when ECGI locates an area of rotors and drivers, it is highly likely this is where the source of additional arrhythmias will most likely be found. This insight reduces or eliminates the need (and time) to search other areas of the heart thereby shortening procedure length and decreasing the number of lesions needed. ECGI mapping and ablating is changing our understanding of and our techniques for ablating persistent A-Fib. If a patient has continued arrhythmias after the initial ablation, ECGI often can re-map and identify where the remaining arrhythmias are coming from, usually very near previously identified driver locations. This is a valuable insight for doctors doing ablations. For patients, it may mean a shorter procedure time with fewer burns needed to eliminate the sources of A-Fib signals. ECGI is changing everything—not only the way mapping and ablations are done, but also our basic understanding of A-Fib. Instead of potentials and CFAEs, EPs will focus on ablating drivers (rotors and foci). Ablating the PVs will still be basic. But in more difficult cases, EPs must look for non-PV triggers or drivers. Prof. Michel Haïssaguerre of the French Bordeaux group/LIRYC gave a presentation entitled “Beyond PVI—Mapping and Ablation Techniques for Elimination of Drivers in Persistent AF.” Non-Invasive Electrocardiographic Imaging, or ECGI (from CardioInsight) is a radically new and innovative mapping and ablation system. The day before their ablation, the patient lies down on their back and a technician places a vest-like device with 256 electrodes over their chest and stomach. These electrodes combine with rapid CT (Computed Tomography) scans to produce a very detailed 3D color map of the heart. The system automatically detects rotors and foci and computes them into a “Cumulative Map” or movie. These driver regions are ranked, based on statistical prevalence. They are displayed in statistical density maps which define the ablation roadmap. The ECGI vest doesn’t directly record A-Fib signals from the septal regions. But Dr. Haïssaguerre showed slides where the septal drivers project onto the anterior and posterior attachments of the septum and are thus able to be mapped. For a detailed description and discussion of the ECGI system, see 2013 BAFS: Non-Invasive Electrocardiographic Imaging (ECGI). Ablation using ECGI results in a drastic decrease of RF burns needed to produce A-Fib termination. Persistent: But in 248 persistent A-Fib cases (54% with Structural Heart Disease), he found multiple interplaying A-Fib drivers coming from both atria but usually clustered in 4 regions. (The regions could vary from 1-7.) These drivers were short lived (3-4 reentries/firings) but periodically recurred in the same areas. As one would expect, the number of driver regions increased with the duration of persistent A-Fib. Long-Lasting persistent had 7 driver regions diffused throughout the atria. Cases with only 1 driver region were rare (9%). Dr. Haïssaguerre showed slides where he ablated driver regions which transformed rapid complex A-Fib signals into slower organized signals. He stated from his own experience and from several studies that the best outcome of ablation was A-Fib termination into sinus rhythm or tachycardia. But this result was much harder to achieve in long-lasting persistent A-Fib. In cases where patients had only recently went into persistent A-Fib (1-3 months), 75% had A-Fib termination targeting driver regions. While in long-lasting persistent A-Fib, only 13% had A-Fib termination. Dr. Haïssaguerre’s hypothesis was that early persistent A-Fib is initially driver-dependent, while long-lasting persistent cases progress to widespread substrate disease. In another study following 90 patients, 85% of patients with A-Fib termination were A-Fib free after 12 months (in the remaining 15%, 54% were paroxysmal). While patients who didn’t have their A-Fib terminated, only 63% were A-Fib free (all were persistent). • Check driver regions (including PVs) to ensure abolition of rapid-disorganized EGMs (electrogram signals). • Body Surface Remapping—to look for new drivers appearing after the first ones are eliminated. Many have observed that this strategy often improves results in difficult cases of long-lasting A-Fib. Dr. Haïssaguerre recommended ablating the right atrium after the left. Right atrium drivers can disappear after left atrium ablation. • Noninvasive mapping visualizes AF drivers which are Multiple, Meandering, ShortLasting and Associated with Complex EGMs (electrogram signals). • Ablation targeting these AF critical regions allows high rate of AF termination with minimal RF delivery. • 85% AF freedom at one year when procedural AF termination is achieved. Non-PV Triggers: If your EP only ablates the PVs, you should look elsewhere. I just read an O.R. (Operating Report) where the EP only CryoBalloon ablated the PVs. Even though the patient was still in A-Fib after the PVs were ablated, the EP didn’t look for non-PV triggers. He simply shocked the patient back into sinus rhythm and put him on an antiarrhythmic drug. Chances are the patient’s A-Fib will return, since the non-PV triggers in his heart weren’t ablated. Driver regions overlap with CFAEs—CFAEs can be ignored: In difficult cases of A-Fib, EPs used to spend a lot of time mapping and ablating CFAEs. Sometimes there were so many CFAEs that the EP wound up debulking much of the left atrium. In Dr. Haïssaguerre’s research, CFAEs could cover nearly half of the total atria surface. But with ECGI, only 19% of that area is ablated. ECGI makes the EP’s job simpler and causes less burns on the patient’s heart. Try to Get Out of Persistent A-Fib: If you haven’t done so already, ask your EP to be Electrocardioverted in order to avoid long-lasting A-Fib which causes atrial remodeling that produces widespread fibrosis and diffuse driver regions. Currently some long-standing A-Fib can’t be cured: The best outcome of ablation is A-Fib termination. But some long-lasting persistent cases turn into widespread substrate disease where it’s not always possible to map and ablate drivers. Even the famed Bordeaux group hasn’t yet figured out a way to achieve 100% success when ablating all long-standing persistent A-Fib. If you have long-standing persistent A-Fib, should you just throw in the towel and give up? No. In Dr. Haïssaguerre experience, 63% of persistent patients who didn’t have their A-Fib terminated were still A-Fib free. You could be in that 63%. Just be realistic and don’t expect miracles. I am a 49-year-old male from the Philippines. I was diagnosed with A-Fib in 2007 at age 42. It happened after I was dehydrated playing golf. The A-Fib resolved by itself after a few hours. But after a few months, I had another attack. When I went to the ER, an ECG documented the AFIB. I was not given any medication but was advised to stay away from triggers which I did. I even stayed away from cigarettes, drinking, chocolates, food with monosodium glutamate. I did not have any attacks for a year, but my thyroid hormones were becoming abnormal due to the amiodarone. I had no known A-Fib attacks for three years until I was operated on for a herniated disc in 2010. The severe pain and the medications probably triggered the A-Fib again as I had several attacks. I was referred to an electrophysiologist in Manila which is an hour and half plane ride from our province. This time I was given amiodarone and Coumadin. I did not have any attacks for a year, but my thyroid hormones were becoming abnormal due to the amiodarone. I was shifted to 100mg flecainide bid which again limited my A-Fib to probably one attack per year. At this time I was already doing research about what other options were available, because I know that in time, the medications will stop working. In 2010, I was already in touch with Steve Ryan and had already heard of ablation. I had written several big centers and inquired about ablation procedures and cost. I wrote emails to Bordeaux and to the secretary of Dr. Natale. But since the attacks were few and far between, I decided to stick to medication which controlled the symptoms. It was a choice between having the ablation in San Francisco or the Bordeaux group…The cost made me decide on Bordeaux, because it cost half that of San Francisco. However mid-2014, after a bout of flu, the A-Fib symptoms recurred and the attacks became more frequent. I learned that at this time that there was an ablation center here in Manila, but it is still in the infancy stage. So, I decided to go abroad. It was a choice between having the ablation in San Francisco or the Bordeaux group since they have been the most talked about ablationists in the forums. The cost made me decide on Bordeaux, because it cost half that of San Francisco. In August 2014, I wrote Bordeaux emails, and they made me answer a questionnaire to determine my status. I sent my reply and was told I would be a good candidate. I was given an ablation date Nov 3, 2014, more than 2 mos. from the time I inquired. I was instructed to do some blood tests and a TEE 2-3 weeks prior to my ablation and to settle the payment for the procedure 1 month before the ablation date. I complied with all of these requirements, got a medical visa from the French Embassy, plane ticket, hotel booking and was all set. I arrived in Bordeaux on Oct 29, 2014. Since we still had time, we first went to Lourdes, France and then back to Bordeaux the next day. Nov 3, 2014, Monday, I was told to be at the Hospital at 8am. To be sure that we didn’t get lost, we took a cab which cost around 45 euros coming from the center of Bordeaux near the opera house. Admission was a breeze, and I made sure we had internet which you can get in the Admitting section (ask them about it because the nurses are not familiar with it). I made sure of the internet connection to be able to use the app I downloaded which helps me to communicate in French. (Translate App) When you type in English, the app will translate it to French. I was attached to a holter monitor whose signals were transmitted to the nurse’s station. The first day was spent getting X-rays, lab exams, preparation and shaving of the groin area. They also started injecting heparin. I was told to stop amiodarone 5 days prior to ablation. But since I learned from Steve Ryan that amiodarone has a long half-life, we asked Dr. Jais thru email if the instruction was right. He was able to correct it to 10 days prior to ablation and pradaxa 48 hours prior to ablation. The next day, I received IV fluids and was brought down to the CT scan area. I laid down on a bed and was given a vest which I learned later was an ECGI. It’s the new procedure which, according to Dr Haissaguerre, is not yet in use in the US. But they have found it very useful and promising. I think I was the 2nd case that day since I was brought down at the theatre at 1 pm. I did not see Dr Haissaguerre at that time nor prior to the procedure which made me a little bit anxious. But I was assured by his assistant that He will be doing the ablation. The assistant doctor asked me if it was ok that he start with the insertion of the catheter and that Dr Haissaguerre will be the one doing the ablation later, to which I agreed. I must have dozed off. Because when I became aware again, I heard that we were about to be finished. Although during the ablation there were instances where I felt my heart going very fast, then they would later massage my neck area. And then after a while, there were two more cycles like that. I was told later that, since I was not in A-Fib, they had to induce me several times. My procedure took almost 4 hours. Wednesday, when I woke up, I had a fever of about 39 degrees and had a difficult time breathing. The nurses upon instruction from the doctor gave me paracetamol which lowered the fever, but I was still in pain if I breathed. I was really worried at that time and kept on reminding the nurses to ask the doctor when will they see me so I can talk with them about these symptoms. That night, a young doctor came to my room with a portable 2d echo and, after examination, concluded I had fluid around my heart and that the fever and the difficulty of breathing were related to that. I was given an anti-inflammatory which relieved the symptoms in 2 days. At this time my abdomen was black and blue due to the round-the-clock injection of heparin. Towards the evening , I was allowed to start with soup and yogurt and later solid foods if I could tolerate them. Thursday, the fever and the difficulty of breathing diminished. The nurses also advised me to start pradaxa after my last dose of heparin. I was allowed to sit up already and go to the bathroom. In the afternoon, Dr Haissaguerre was able to visit me which was the first time I met him face-to-face. My wife told me that he visited a few hours after my procedure, but I was mostly asleep at that time. He had an aura of confidence in him that made me feel that I was talking to a very knowledgeable person. He explained that I had 3 problematic areas. 1 in the atrial septum and 2 near the pulmonary veins. He added that since I was not in A-Fib, they had to induce it with isoproterenol. Dr Haissaguerre stayed in the room for almost an hour explaining to us what was done and what to expect in the future. I asked him how many international patients they have. He informed that they accept only 2 international patients per week. They started with the atrial septum focus which made the A-Fib stop after they had ablated it. But since they knew that I had 3 problematic areas even before the procedure, they induced me again and ablated the 2 remaining areas near the pulmonary veins. After that I was told they could no longer induce my A-Fib. Dr Haissaguerre stayed in the room for almost an hour explaining to us what was done and what to expect in the future. I asked him how many international patients they have. He informed that they accept only 2 international patients per week. And I was told that I was the first Filipino patient he had. I was also able to meet for the first time Laurence Bayle, the secretary of the doctors with whom I was in contact most of the time. Sometimes it would take a day or two for my emails to be answered, sometimes a week. But despite that, I was able to arrange and carry out my ablation. Probably the volume of the inquiries made it impossible for them to answer immediately. The next day, Friday, I was told that I would be discharged. I was given all the instructions. While waiting for our Dr Haissaguerre to meet us prior to discharge, we were able to go around the hospital and outside it. From what I understand, it’s a big hospital building which caters solely for heart patients. We were sent to the admitting section to settle our accounts, but we were told that we would have no additional payments, as everything is included in the package. When Dr. Haissaguerre arrived to see us in the afternoon, I informed him about skipped beats which bothered me post op. He told me that it was normal for an ablated heart to skip beats especially since I had a pericardial effusion, but that they will go away in time. (the skipped beats slowly went away in a month’s time). I went back to the hospital in November 10, 2014 for my final check-up prior to being allowed to go home. The next few days, we opted to go to Paris and spent some vacation time just in case there was still a need to see Dr. Haissaguerre prior to our flight back home to the Philippines. The whole “healing journey” was very memorable. I cannot believe that I really went out of country just to have the procedure, but everything went as planned. A lot of anxious moments and hesitancy, but I made it through. A few hitches here and there, but nothing that couldn’t be handled. In this age of the Internet, we as patients have the power to learn more about our disease and act accordingly. We can opt to just live with it which is not really a bad choice as a lot of A-Fib patients have done successfully. Or we can be proactive about it. Of course the ablation procedure is not 100% curative nor 100% safe, But I made my decision based on my goal that I still wanted to practice my profession as a doctor. I owe it to my patients to try to heal myself by the best possible means so that I can render the best medical service to them. I am now exactly 100 days post ablation. I’m still on anticoagulants, but am A-Fib free. In the last conversation I had with Dr Haissaguerre, I asked him if there are things that I am prohibited to do or food that I am not allowed to eat, and he told me no prohibitions. “Live a Normal life” and that’s what I plan to do. Because Dr. Carlo had been in A-Fib for some time, his ablation probably was more challenging. It took four hours which was longer than usual considering that the mapping had been done already by the ECGI system. He had a minor pericardial effusion which is often unavoidable in more extensive ablations. The ablation Dr. Carlo had represents a radical, transformative change in ablation therapy and may alter the way ablations are done. Normal catheter ablation for A-Fib usually starts with isolating the pulmonary vein openings. But Dr. Haissaguerre instead started with the atrial septum area as indicated by the ECGI system. Only later did he go to the pulmonary vein areas. ECGI will certainly change the way catheter ablations are performed. Dr. Carlo Romero is a great example of a proactive A-Fib patient who educated himself about A-Fib, researched all his options, found the right doctor for him, and wouldn’t settle for less than the opportunity for a complete cure of his A-Fib. When I think about the field of atrial fibrillation in 2013, several thoughts come to mind. 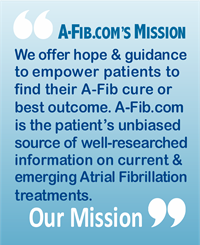 There were technical advancements, some new drug therapies, and additions to our understanding of Atrial Fibrillation (and a few accomplishments for our A-Fib.com website). Perhaps the most important technical innovations in 2013 for A-Fib patients were the introduction of two new heart imaging and mapping systems. A third system, the Bioelectronic Catheter, represents a whole new technology with tremendous potential for A-Fib patients. The ECGI system, combined with a CT scan, produces a complete 3-D image of your heart along with identifying all the A-Fib-producing spots. Think of it as an ECG with 256 special high resolution electrodes rather than 12. It greatly reduces your ablation time and your radiation exposure. Why are these two technologies important? ECGI allows your imaging & mapping to be performed the day prior to your ablation, rather than during your ablation. This shortens the length of your ablation procedure. In addition it reduces your radiation exposure and produces remarkably accurate 3D images of your heart and identifies where A-Fib signals are coming from. The FIRM system, though performed during an ablation rather than before it, may be a significant improvement over the Lasso catheter mapping system now in current use. Both systems may mark a new level of imaging/mapping for A-Fib. The merging of living systems with electronic systems is called “bioelectronics”. Key is a flexible, pliable circuit made from organic materials—the carbon-based building blocks of life. Bioelectronics have entered the EP lab with a prototype of a ‘bioelectronic catheter’, the marriage of a pliable integrated circuit with a catheter balloon. This is a remarkable time in the history of A-Fib treatment. Three very different technologies are poised to radically improve the way A-Fib is detected, mapped and ablated. We’ll look back at 2013 as a watershed year for A-Fib patients. In 2013 we saw three new anticoagulants, a welcome development for A-Fib patients. Note: the new anticoagulants are very expensive compared to the proven anticoagulant warfarin. Warfarin seems to have a slightly higher chance of producing intracranial bleeding. Eliquis, in general, tested better than Xarelto in the clinical trials, but it’s so new we don’t have a lot of real-world data on it yet. And, as with Pradaxa, neither have antidotes or reversal agents. In addition, there was what some consider a major problem with the clinical trials comparing the new anticoagulants to warfarin. ‘Compliance’ rates by warfarin users were poor (many either weren’t taking their warfarin or weren’t in the proper INR range). Did this skew the results? And finally, unlike warfarin where effectiveness can be measured with INR levels, we don’t have any way to measure how effectively the new blood thinners actually anticoagulate blood. Read more of my article “Warfarin vs. Pradaxa and the Other New Anticoagulants“. Keep in mind: ‘New’ doesn’t necessarily mean ‘better’ or ‘more effective’ for You. High Blood Pressure with Your A-Fib? Is Renal Denervation a solution? As many as 30% of people with A-Fib also have high blood pressure which can’t be lowered by meds, exercise, diet, etc. There was hope that Renal Denervation would help. Obesity is a well known cause or trigger of A-Fib, probably because it puts extra pressure and stress on the Pulmonary Vein openings where most A-Fib starts. In 2013 A research study report focused on obese patients with A-Fib. Those who lost a significant amount of weight also had 2.5 times less A-Fib episodes and reduced their left atrial area and intra-ventricular septal thickness. Good news! Losing weight can potentially reverse some of the remodeling effects of A-Fib. Related article: Obesity in Young Women Doubles Chances of Developing A-Fib. Obstructive Sleep Apnea (OSA) is another well recognized cause or trigger of A-Fib. Anyone with A-Fib should be tested for sleep apnea. Earlier studies have shown approximately two-thirds (62%) of patients with paroxysmal or persistent A-Fib suffer from sleep apnea. In 2013, research reports showed that the worse one’s sleep apnea is, the worse A-Fib can become. In addition, sleep apnea often predicts A-Fib recurrence after catheter ablation. Before an ablation, Dr. Sidney Peykar of the Cardiac Arrhythmia Institute in Florida, requires all his A-Fib patients be tested for sleep apnea. If they have sleep apnea, they must use CPAP therapy after their ablation procedure. The original A-Fib.com web site was created using the phased out software MS FrontPage. Thanks to a “no strings attached” grant from Medtronic, A-Fib.com was reinvented with a more up-to-date but familiar look, and features more functionality (built on an infra-structure using Joomla and WordPress). We can now grow the site and add features and functions as needed. Back when I started A-Fib.com in 2002, there were less than a dozen sites performing ablations for A-Fib. Today our Directory of Doctors and Facilities lists well over 1,000 centers in the US, plus many sites worldwide. Increasingly, doctors were writing me asking why they weren’t included, or why their info was incorrect since they had moved, etc. To update our records and our service to A-Fib patients, starting in July 2013, we prepared and mailed letters to over 1,000 doctors/facilities. We asked each to update/verify their listing (and include a contact person for our use). Note to Doctors! If you haven’t updated your listing in our A-Fib.com Directory of Doctors and Facilities, just use our Contact Us form to email me and I’ll send you the form to fill in and return. The response to our bulk mailing was great. The data input started in October and continued for several months (as time allowed). Recently, we cut over to the ‘new’ Directory menu and pages. 2014 Boston AFib Symposium Reports: Check out my new reports from the 2014 Boston A-Fib Symposium (BAFS) held January 9-11, 2014 in Orlando FL. The first two reports are posted. Look for more reports soon. I usually end up with 12-15 reports in total. Amazon Best Sellers list: Our book sales continue to grow. 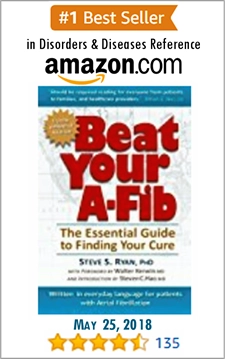 Did you know that our book ‘Beat Your A-Fib’ has been on Amazon’s Best Sellers list continually in two categories (Disorders & Diseases Reference and Heart Disease) since its debut in March 2012? Visit Amazon.com and read over 40 customer reviews. Visit our shop at Spreadshirt.com. In our efforts toward sustainabiliy, several years ago we added a PayPal ‘Donate’ button (you don’t need a PayPal account to donate) and invited donations toward our onlline maintenance costs. Then, a year or so ago, we added a portal link to Amazon.com. 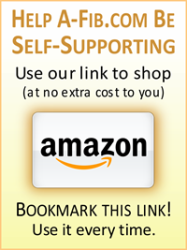 When you use our Amazon.com link, A-Fib.com receives a small commission on each sale (at no extra cost to you). 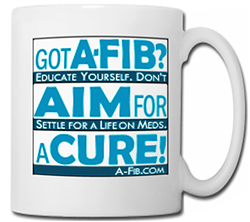 Our newest effort is our ‘A-Fib can be Cured! shop with T-shirts and more at Spreadshirt.com. With each shirt purchase $2 goes to support A-Fib.com. (We will roll out new designs every quarter or so). Help A-Fib.com become self-sustaining! 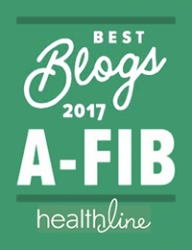 Help keep A-Fib.com independent and ad-free. 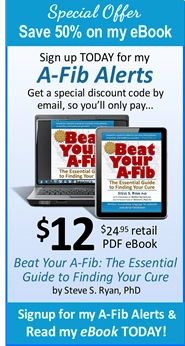 Will 2014 be the year you help support A-Fib.com? Your doctor may use a Holter or an Event Monitor. A Holter Monitor records your EKG continuously, usually for 24 hours; an Event Monitor can be used for up to 30 days or longer. For a more in depth discussion about Holter and Event monitors, see my report A Primer: Ambulatory Heart Rhythm Monitors. To monitor for A-Fib yourself, try a consumer, or DIY, sports heart rate monitor available from sporting goods stores. Used by runners and other athletes, they rely on the use of a chest strap to pick up the electrical signals from the heart and transmit to a special wrist watch. On most you can program a high heart rate zone which you might enter only if you were in A-Fib. That way you could record when and how long you stayed in A-Fib and what your max heart rate was. Some have internal storage recording that can be download to your PC to view data in a graphic form. We like the “Polar” brand. Check out the array of Polar brand heart rate monitors on Amazon.com. Other companies include Timex, Garmin, Acumen, Nike, and Cardiosport. For an in-depth review of DIY/sports monitors, see my report: Consumer (DIY) Heart Rate Monitors. Yes, MyPulse by Smart Monitors, Inc. has a solution for you. This is a practical alternative to the expense of a medical monitoring service if you are just interested in simple heart rate data. Most consumer heart rate monitors rely on a chest strap which transmits heart rate data to a wristwatch. The MyPulse Long Range Monitor has a small Repeater device carried by the person wearing the chest strap. The Repeater transmits the data to a Receiver which is connected to a PC/notebook via a USB port. The MyPulse application runs on a PC and provides a graphic display of real time heart rate data. The software can be configured to provide alerts via email or text message to multiple recipients if a preset heartbeat limit is exceeded. Here are the cool parts: the software can be configured to provide alerts via email or text message to multiple recipients if a preset heartbeat limit is exceeded (such as might occur if the wearer goes into A-Fib). For the more tech savvy, a PC mirror app on your smart phone lets you view real time heart rate data at anytime, anywhere. Check out the MyPulse website or see the array of MyPulse the Smart Monitors on Amazon.com. For a more in depth discussion see Treatments/Diagnostics: A Primer: Ambulatory Heart Rhythm Monitors. Without medical help you may not be able to tell the difference. (It’s been reported that indigestion is sometimes a side effect of an A-Fib attack.) Only a doctor can determine if you have A-Fib. To verify if you have A-Fib, a doctor will use an ECG test or have you wear a monitoring system such as a Holter or an event monitor. To read more about these monitors, see my report: A Primer: Ambulatory Heart Rhythm Monitors. If you want to monitor yourself (which may not necessarily be a good idea), you can start by taking your own pulse. It’s worn around your chest and transmits a signal to a wristwatch that beeps when your pulse goes too high. You can check the digital display on the watch to see how fast your pulse is. For an in-depth review of DIY/sports monitors, see my report: Consumer (DIY) Heart Rate Monitors and my Shopping Guide to DiY Monitors. Warning: any over-the-counter device is no substitute for monitoring and treatment by a doctor. You should not use over-the-counter devices to diagnose yourself. In a further discussion of the ECGI mapping and ablation system, Dr. Phillip Cuculich of the Washington University School of Medicine in St. Louis, MO gave a presentation entitled “Advances in and Limitations of Noninvasive Mapping of AF.” (For a detailed description and discussion of the ECGI system, see 2013 BAFS: Non-Invasive Electrocardiographic Imaging ECG (ECG). Background: ECGI stands for Non-Invasive Electrocardiographic Imaging used at Yoram Rudy’s lab at Washington University in St. Louis to understand the mechanisms of heart rhythm disease. A similar system called Electrocardiographic Mapping (ECM/ecVUE) uses similar technology, but has been developed and tested for clinical use in Europe (http://www.cardioinsight.com) and has different goals. Each group works independently and has different ways to seek solutions. The software used by the ECGI system to produce data and images from the multi-channel ECG mapping and CT scan is called CADIS. • In complex (Long-standing Persistent) A-Fib, he showed movies of four or more simultaneous wavelets, a high degree of wavelet curvature, and frequent wave breaks (no focal sites). The patterns tend to repeat and follow a preferred path. Another major difference in ECGI and FIRM is that ECGI uses wavelet analysis (activation of the wavefront), while FIRM and CardioInsight uses phase mapping to describe the behavior of the arrhythmia. The main point of Dr. Cuculich’s presentation is that one must be very careful when applying phase techniques, as it can introduce rotor behavior into the imaging map. Dr. Cuculich’s group is studying whether this rotor behavior may be a true cause for the maintenance of A-Fib or just an artifact. In a conversation with the author, Dr. Cuculich brought up comments that perhaps ECGI/ECM uses too many electrodes to see stable rotors, that perhaps panoramic imaging with fewer electrodes could improve the identification of rotors. (ECGI has a much larger number of electrode points in the heart [usually 1000] compared to FIRM [64 max].) To test this hypothesis, he analyzed A-Fib using 64 spaced electrodes in each atrium vs. standard ECGI. It turned out that fewer electrodes did not help to visualize rotors. We’re grateful to Dr. Cuculich for his comparison of ECGI and FIRM which helps us understand both imaging system better. But it’s definitely disturbing that both systems vary so greatly. Why does the FIRM system find 70% rotors and ECGI only 15%? Why are FIRM’s A-Fib signals stable and ECGI’s transient? Why does the FIRM system not focus on wavefronts and wavelet transformation? One way to resolve these discrepancies would be to use a standard Lasso mapping catheter to meticulously map every potential A-Fib-producing spot in an animal or human with Long-standing Persistent A-Fib (where one would expect to find multiple A-Fib producing spots in the heart). Then immediately use both the FIRM and ECGI system to map the same heart and compare the results. Perhaps the single biggest new discovery in human A-Fib mapping is rotors. But there’s considerable debate about their definition and behavior. Dr. Cuculich found that rotors are relatively rare (15%), whereas the FIRM and CardioInsight studies indicate that 70-80% of A-Fib drivers are rotors. Dr, Cuculich introduced new concepts, insights and vocabulary to our understanding of A-Fib, (some of which I’m still having trouble wrapping my head around). Are wavefronts and wavelet transformation important in themselves or are they part of the development of rotors? Phase mapping and wavelet transformation applied to A-Fib is a major innovation that may lead to a better understanding of how A-Fib signals activate in the heart. Besides making mapping and ablating A-Fib easier and more effective, ECGI with its detailed, high resolution capabilities may give us new insights into A-Fib. 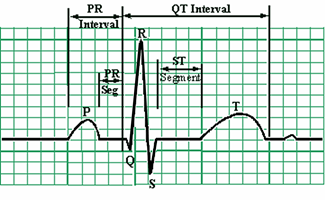 Dr, Haissaguerre began by discussing the concept of voltage vs. noise in reading an ECG. High accuracy can be obtained with a EGM (electrogram signal) of >0.15mV. Body Filtering (ECGI) can miss small local A-Fib signals, but does not affect global patterns. The system automatically detects rotors and foci and computes them into a “Cumulative Map” or movie. These driver regions are ranked, based on statistical prevalence. Dr. Haissaguerre showed slides of these drivers originating from PVs in Paroxysmal A-Fib. In persistent A-Fib he found multiple interplaying driver regions (median 4, 1 to 7) found in the Left Atrium, PVs and Right Atrium (“driver regions” include both focal sources and rotors). The rotors were temporally and spatially unstable. They were not sustained. Most had 2-3 rotations with a mean of 448ms. They required a statistical analysis of their core trajectory/density. Patients in Persistent Long-Lasting A-Fib for more than six months had the most driver regions and the least success in A-Fib termination after six months. …ECGI ablation significantly reduced the amount of burns needed to terminate A-Fib. Compared to the traditional Bordeaux step-wise ablation for persistent A-Fib, ECGI ablation significantly reduced the amount of burns needed to terminate A-Fib. Dr. Haissaguerre uses a Multielectrode circular catheter not yet approved for use in the US. This catheter can more easily capture and isolate regional targets like rotors that do move a little. ECGI mapping before a procedure identifies critical regions to ablate. This reduces targeted atrial areas and RF delivery. The optimal timing is in the early months of persistent A-Fib. There is a need for appropriate ablation tools (such as circular or multielectrode catheters) as rotor targets are not so limited (they tend to move slightly). Not only does the ECGI system produce a complete, precise, 3D, color video of each spot in a patient’s heart producing A-Fib signals, but also an ECGI can be done by a technician before the procedure rather than by a doctor during an ablation. And the ECGI map is a better, more accurate, more complete map than an EP can produce by using a conventional mapping catheter inside the heart. From a patient’s perspective, ECGI reduces both the time it takes to do an ablation and the number of burns a patient receives. The only caveat that Dr. Haissaguerre found (which relate to all mapping strategies, not just to ECGI) is that rotors move slightly and are somewhat unstable. A computer has to be used to statistically analyze their core trajectory. But circular catheters can be used to contain and isolate them. Patients wearing ‘vest’ lies down for the ECGI. The ECGI system, combined with a CT scan, produces a complete 3-D image of your heart along with identifying all the A-Fib-producing spots. Think of it as an ECG with 256 special high resolution electrodes rather than 12. It greatly reduces your ablation time and your radiation exposure. A day before your ablation, you simply don a special vest with 256 electrodes covering your upper torso, and lay down. The FIRM system uses a different approach to mapping the heart and the A-Fib producing spots. It uses a basket catheter inside the heart to map large areas in a single pass and reveal the location of foci and rotors. Read more of my article on the FIRM System… Why are these two technologies important? ECGI allows your imaging & mapping to be performed the day prior to your ablation, rather than during your ablation. This shortens the length of your ablation procedure. In addition it reduces your radiation exposure and produces remarkable accurate 3D images of your heart and where A-Fib signals are coming from. The FIRM system, though performed during an ablation rather than before it, may be a significant improvement over the Lasso catheter mapping system now in current use. Both systems may mark a new level of imaging/mapping for A-Fib. In a mapping application, the deflated bioelectronic balloon catheter is slipped into the heart, then pumped up. The inflated integrated circuit conforms to the heart’s grooves and makes contact with hard-to-reach tissue. It can map a hundred electrical signals simultaneously, across a wider area and in far greater detail than had been previously possible. And it’s being developed to function in reverse. What a remarkable time in the history of A-Fib treatment! Three very different technologies are poised to radically improve the way A-Fib is detected, mapped and ablated. We’ll look back at 2013 as a watershed year for A-Fib patients. Tingley, Kim. Annals of Medicine, The Body Electric: A scientist takes computing power under the skin. The New Yorker, November 25, 2013, pp. 78-86.